There never seems to be enough time in a day to get everything done. Some days I’ll be doing so much work that there just isn’t time for me to make myself a nice lunch. And skipping lunch is never a good idea, because that just leads to binge eating all of the cookies I have lying around my house. The point of this story: don’t skip lunch, just be prepared. And what better way to be prepared then to have loads of little pre-made salads sitting in mason jars in your fridge? You can make your lunch for the entire week using this method. Whenever you have a free half hour on a Sunday afternoon, grab a bunch of kale and salad fixings and get to work. 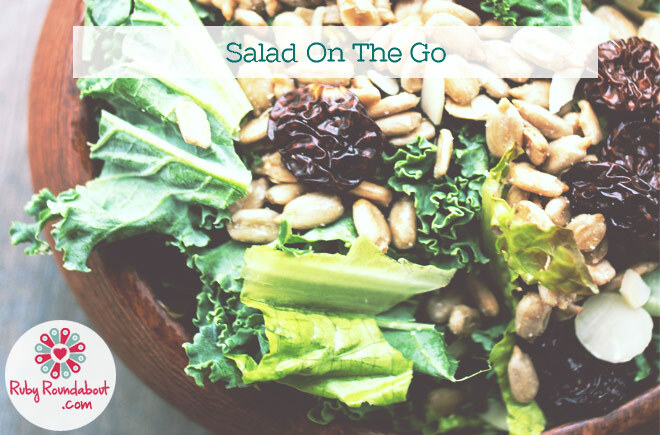 The beauty of these on-the-go salads is that you have the opportunity to put whatever you’d like in them. Mine was a mixture of kale, red leaf lettuce, slivered almonds, sunflower kernels, and golden berries, but you can add whatever you have lying around in your kitchen cabinets! You can even make a different salad for every day of the week so you never get bored. Spinach, dates, walnuts, pumpkin seeds, the possibilities are endless. My salad was 2/3 kale and 1/3 lettuce, which is how most of them should be. If you don’t mind the taste and consistency of raw kale, try using it for your entire salad! The kale can easily be swapped out for spinach if you prefer, since both pack in a large amount of nutrients. You’ll never have an excuse to skip lunch again! 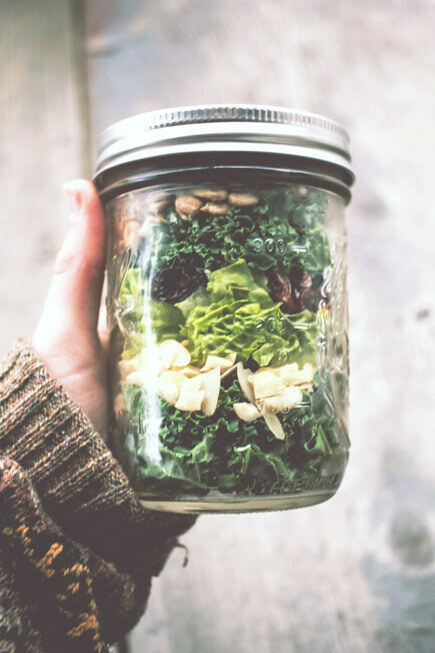 Simply grab the mason jar out of your fridge and add a splash of olive oil, balsamic vinegar, lemon juice – whatever you prefer! Add ingredients to the mason jar in layers. Mine went as such: 1/2 of the kale, then the slivered almonds, then all of the red leaf lettuce, then the dried golden berries, then the rest of the kale, then the sunflower kernels. These salads can be eaten straight from the jar or transferred to a bowl.